I’ve visited GINZA SIX numerous times since it opened, but I always make new discoveries every time I come. In full-on work mode, I research luxury brand boutiques. In full-on leisure mode, I visit the restaurants to enjoy wonderful food. Once, operating in both modes, I suddenly noticed something! And that’s that visitors here have the opportunity to encounter wares embodying the apogee of Japanese pride in nearly every field. I’m a real food lover. Honestly, I’d say I spend more time on B2F than anywhere else. But unless I’m really pressed for time, I go on patrol [smiling] on 2F, which is filled with jewelry boutiques. The older I get, the more I feel I’ve missed out on things. 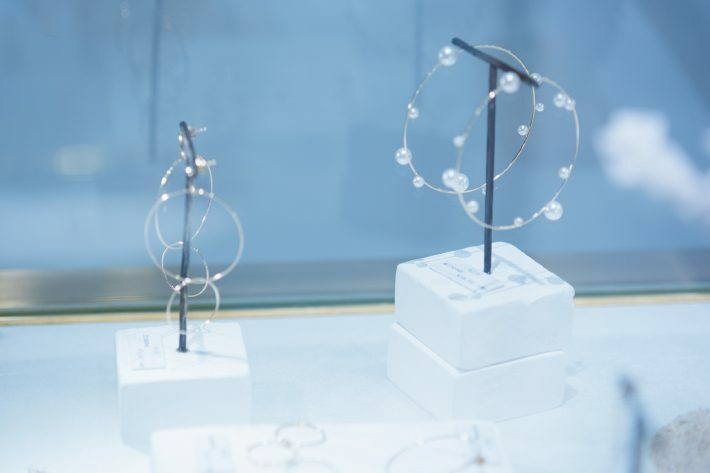 Now I’m seriously considering getting my ears pierced, so I head to AHKAH, a store that sells made-in-Japan jewelry. It’s a sure bet for finding a suitable first pair of pierced earrings! AHKAH was established in 1997. 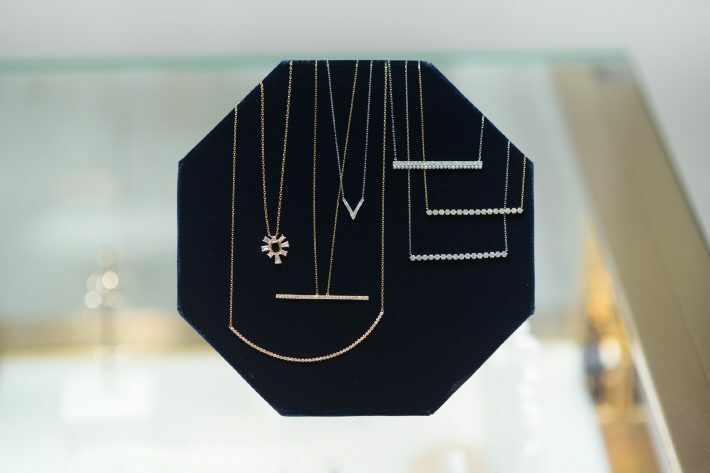 It might be a fairly young brand compared to the world’s renowned jewelers, but it has a unique outlook that merges the subtle and the bold. 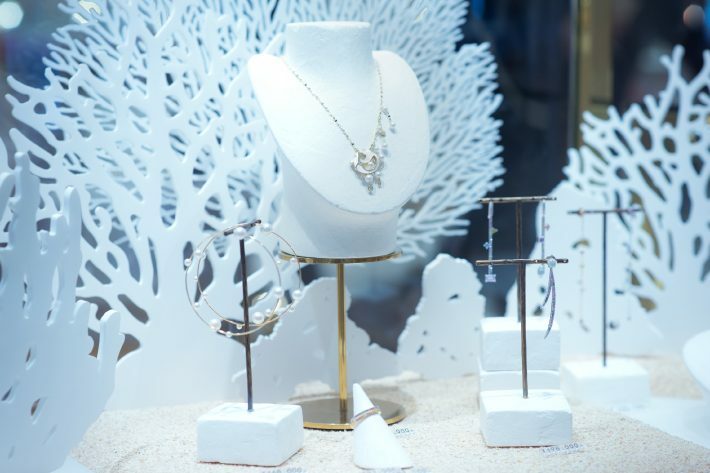 It’s remained a popular jewelry maker with women across a wide span of age brackets. Before I start my earring hunt, I find myself drawn immediately to a display of necklaces arranged as though part of a single picture. 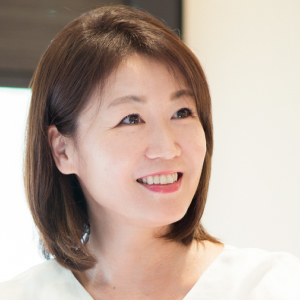 There’s the Tina Line Pearl Necklace, where the pearls stretch out in a single luminous line; and there’s the Diamond You Necklace, featuring diamonds set in a gentle arc (priced at between 94,000 yen and 310,000 yen: all prices listed before tax). My visceral sense is: I want one! Due to the nature of my work, I have lots of opportunities to handle expensive high jewelry. I’m too much the connoisseur, in a sense. It’s something that’s made my disease of always wanting things I can’t actually afford even worse! I somehow manage to suppress the impulse to splurge on something I had absolutely no intention of buying in the first place and reset to my core mission of finding my first pair of pierced earrings. My image of AHKAH is of hoop earrings with delicate motifs and distinctive shapes. And, immediately, I find a pair I like! These are the Bubble Hoop Pierced Earrings, featuring pearls placed asymmetrically on K18 yellow gold hoops (168,000 yen). 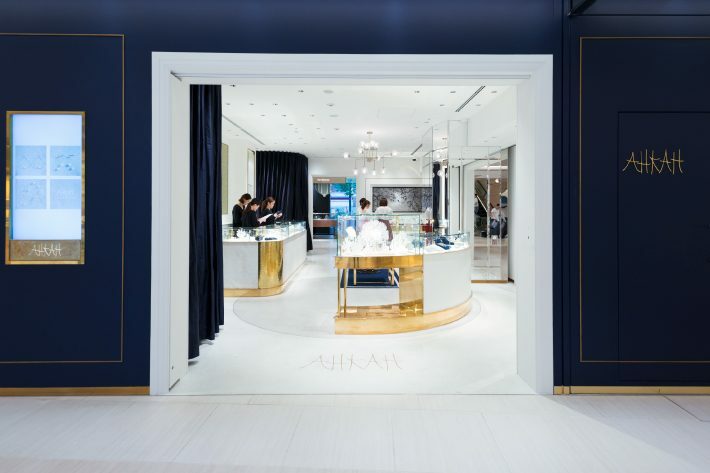 They combine the refinement of AHKAH, all of whose products are made in Japan by skilled artisans, with a freshness that keeps the wearer from looking like too much a middle-aged lady. The combination illuminates the face. My disease of always wanting things I can’t actually afford, which stems from an infection caused by constant exposure to the highest of high jewelry [smiling], has been completely cured, thanks to AHKAH! Their products aren’t pie in the sky items that just make you sigh. They’re luxuries you can actually afford; you only have to grab one when you’re really in the mood to treat yourself! 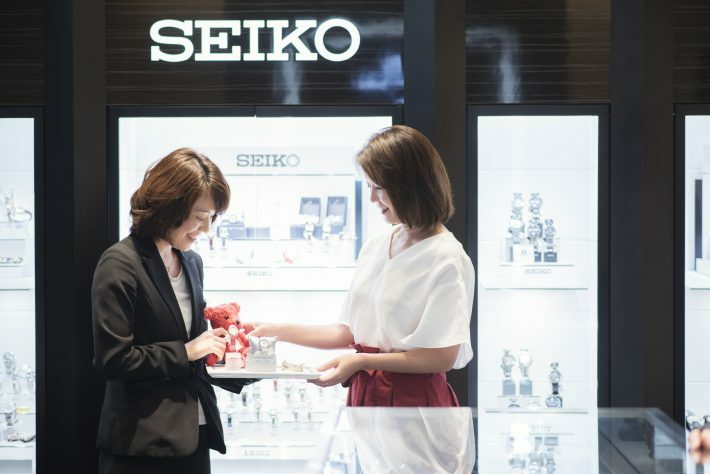 Taking heart and with excitement riding high, I head to the Seiko Boutique on 5F. 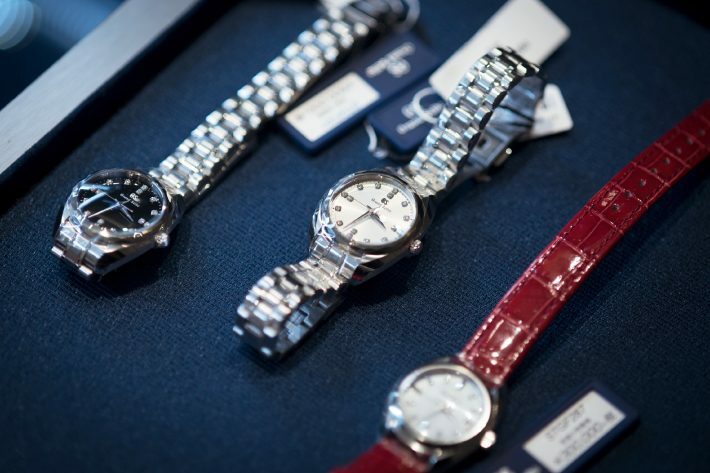 Ever since I wrote a feverish piece about them, I’ve been unable to get the new ladies’ models in the Grand Seiko collection, unveiled at a fair held in March in Basel in Switzerland, out of my mind. That’s why I’m here. Unfortunately, I can’t enjoy a reunion with the limited-edition models released at the time in Basel. 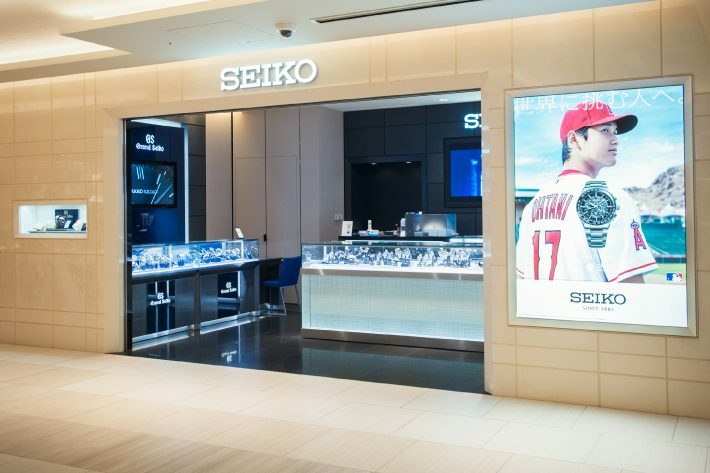 But this store, which is Japan’s first Seiko Boutique and sells only Grand Seiko and other Seiko-brand products, is positioned as a specialty store. The product lineup is incredible: more than 300 items on display at any one time! The Grand Seiko line, which I’ve increasingly warmed to over the past few years, lures me in thanks to its wide range of products (left/center: 40-surface cut K18 white-gold bezel mounted on a beautiful stainless-steel bracelet, 600,000 yen each; right: a simple bezel makes a good contrast with the unobtrusive diamond index, integrating grown-up and girlish tastes, 300,000 yen for the crocodile-skin strap model). Above all, I’m drawn to the striking color of the strap. The bright-red crocodile-skin strap, the classy stainless-steel case, and the mother-of-pearl dial provide an exquisite harmony of elegance. 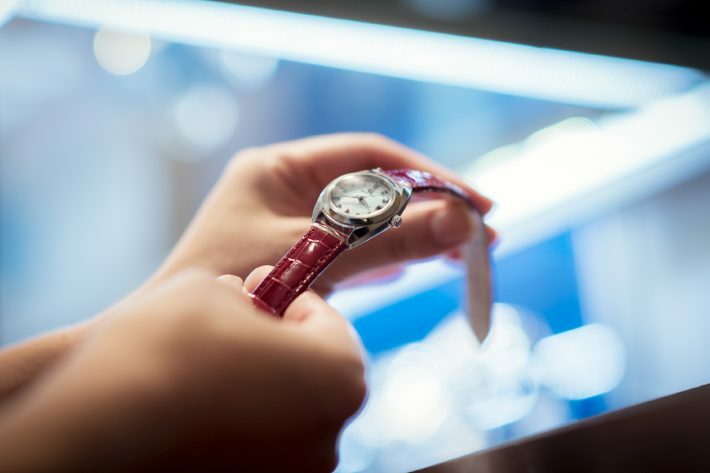 Come to think of it, the reason I’ve come to love watches and working with watches may be that whenever I marked a turning point in my life, like entering elementary school or high school, my father bought me a watch as a memorable gift. Remembering that, I realize I’d like to give my niece, who’s planning to enter university next year, a nice watch as a present, such as Seiko Lukia. I’m given a lot of advice by the store manager, Ms. Uryu, who’s friendly and has a lovely smile. I’m reminded this hospitality is the hallmark of the Seiko brand. I want a watch my beloved niece can use for many years, from university and after she ventures out into the world, and the top candidate is the Seiko Lukia range. Next spring, assuming she passes the entrance exam, I hope to return with her to choose a watch. When I’m cruising GINZA SIX on my own time, one thing I can’t miss out on is delicious food. I adore Japanese cuisine. Here I’m in wonderland, thanks to B2F shops and cafes like Hakejyoyu Noribenyamanobori and Kurogi Chacha, famous for sea bream chazuke (cooked rice with green tea poured over rice), and 13F restaurants like TempuraYamanoue Ginza and Tsukiji Suzutomi, and so on. For lunch today, although I feel like I’ve been rewarding myself all day, I decide to reward myself that much more with a bit of luxury: sushi at Tsukiji Suzutomi. This is the Ginza sushi restaurant and the GINZA SIX sushi restaurant. I’m sure many would pause before entering such an exclusive place, regarding this as something like an ascent of Mount Everest. I’m one of these people myself. 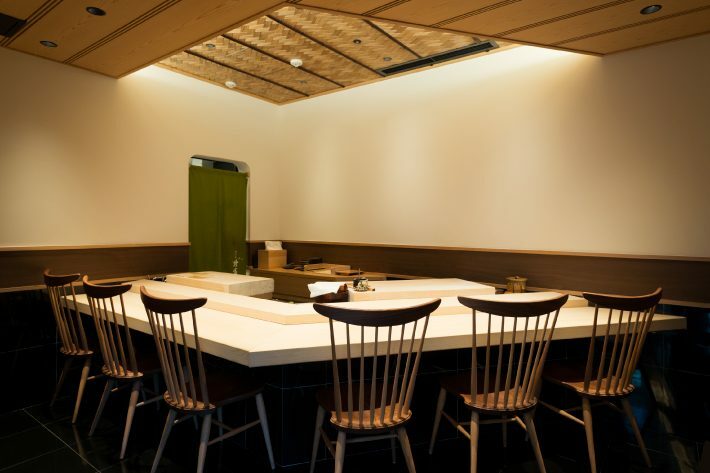 It’s an Edo-style sushi restaurant operated directly by a Suzutomi, a specialist tuna dealer from Tsukiji. 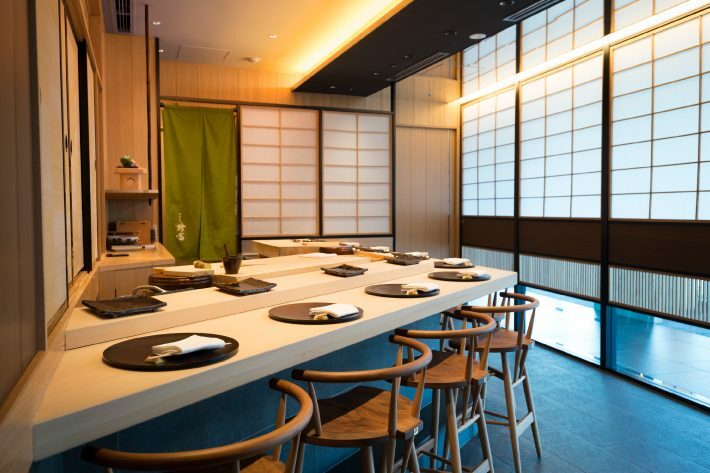 It’s the third such restaurant, following one in the district next to the Tsukiji fish market and one inside the Hotel New Otani in Kioi-cho. Apparently, the company had been looking for an opportunity to open a restaurant in Ginza. Here’s the interior. It’s refined and luxurious, but the hospitality is friendly, and the ambiance is warm. 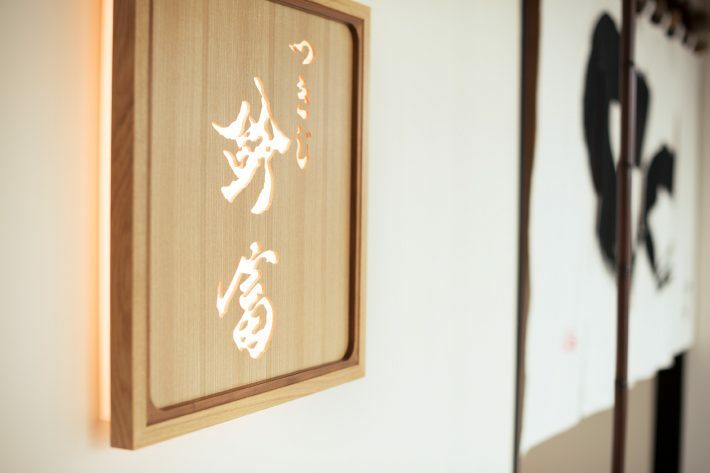 Today I order the Hagoromo lunch set menu (5,400 yen) in a private room with a counter-style table. (The room seats six. There’s a fee to use for the room, and a reservation is required.) 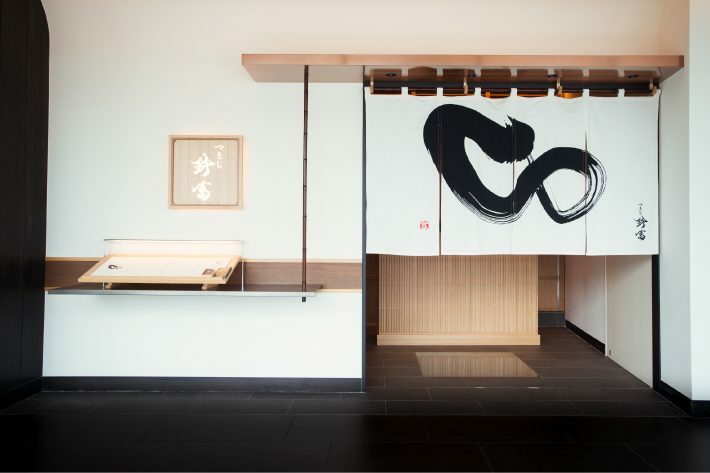 The set menu includes an appetizer, one a la carte dish, seven pieces of sushi, one sushi roll, and a bowl of soup. All that for the one flat price! As high-end as Mount Everest, it’s still great value for money. 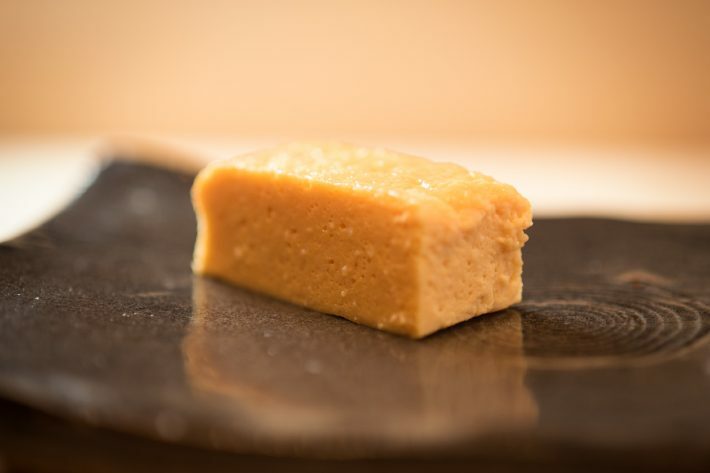 The carefully selected seasonal flavors arrive at Tsukiji from all over Japan. The professionally prepared sushi is aesthetically pleasing, appealing to all five senses. 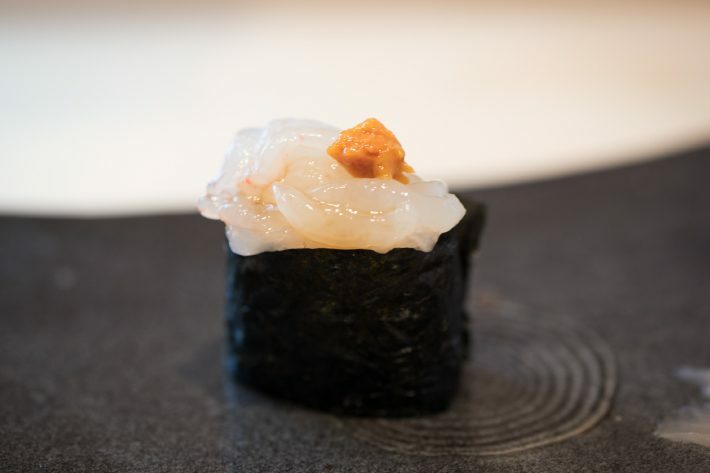 This is a battleship roll of end-of-season Japanese glass shrimp from Toyama garnished with sea urchin. I loved the mellow sweetness and the varying textures of the shrimp and sea urchin! This homemade rolled omelette, too, is a rapture, smooth and melting in my mouth like a soufflé. I have to resist the urge to order another helping. And for the climax…tuna! 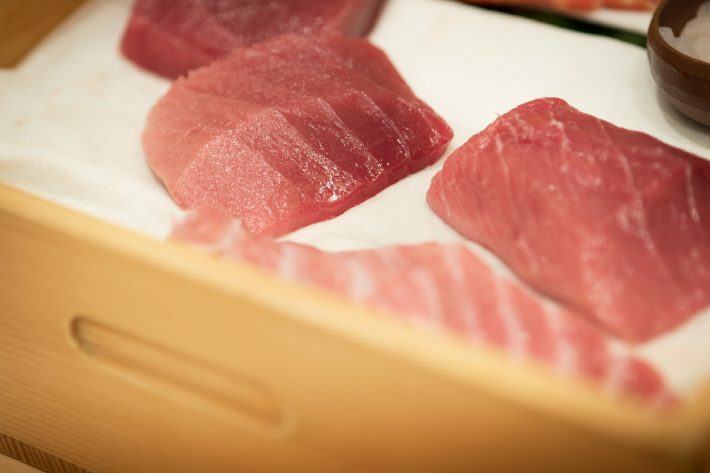 Surely a certain portion of the pride of Tsukiji Suzutomi rests in this natural lean tuna and medium-fatty tuna from Aomori. The restaurant serves more than just sushi. There’s also a wide range of a la carte dishes. 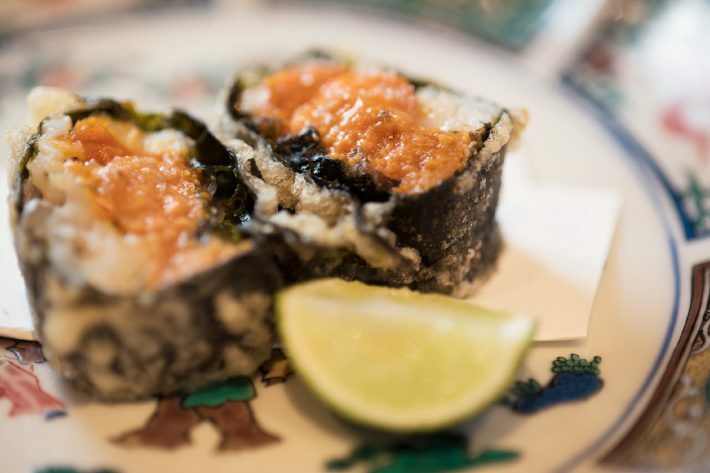 This deep-fried conger eel and sea urchin roll (3,000 yen) is a delight, with the contrast between the light flavor of the eel and the rich flavor of the sea urchin packed into a crispy deep-fried wrapping. Jewelry, watches, and sushi. The wares may run the gamut, but I’ve spent a delightful time at GINZA SIX during which I experienced Japan’s artisanship, sophistication, and aesthetic sense. This space is bound to evolve still further in the run-up to the 2020 Olympics. I hope I remain an adult being capable of enjoying all this with all my heart.